Don’t let the construction tape on the sign fool you, this place is an absolute gem. 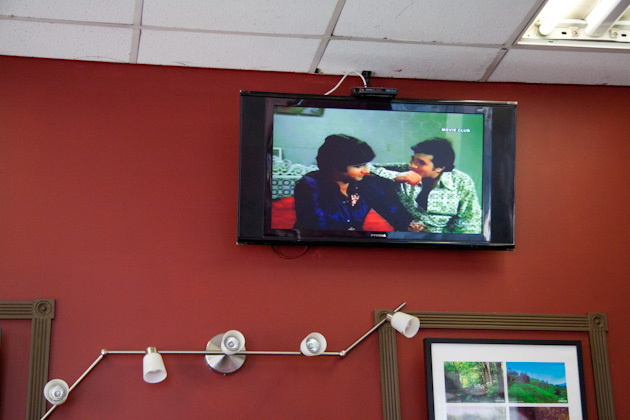 From the delightfully proud and loving owners, to the classic presentation of South Indian cuisine, Canadian Dosa Corner has easily become my new favorite place to grab a nourishing lunch during the workweek. When I was asked to choose a lunch spot for my colleagues and I on my birthday, it was dosa all the way. 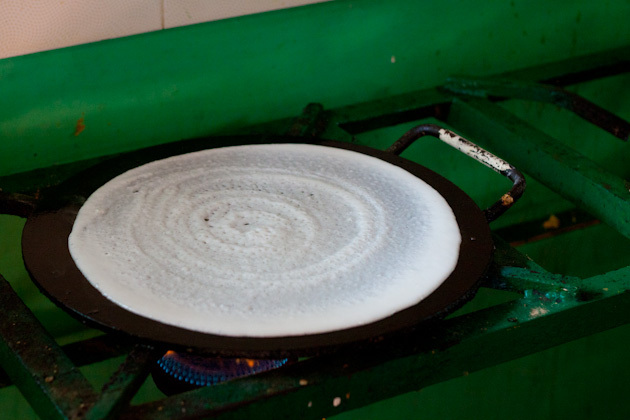 What is dosa? It’s a fermented crepe made from rice batter and black lentils. It’s rich in carbohydrates, contains no salt, sugar or saturated fats, and is naturally gluten-free! 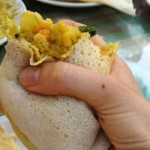 In India, the street food venders usually sold dosa for breakfast, but it can really pass for whatever meal you’d like. 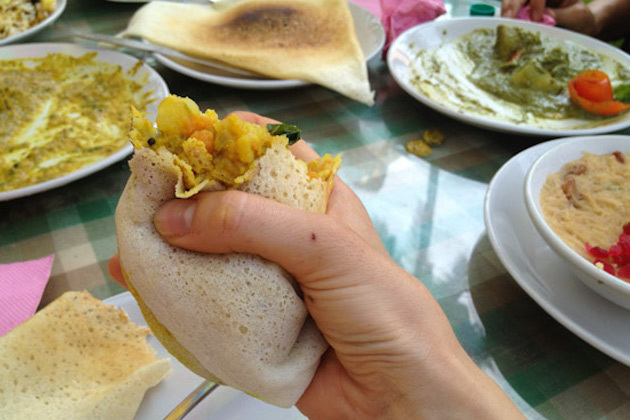 There was a day during my trip to India where I had dosa for breakfast, lunch and dinner, all in the same day. Ya, that’s right… look at me and my bad self! 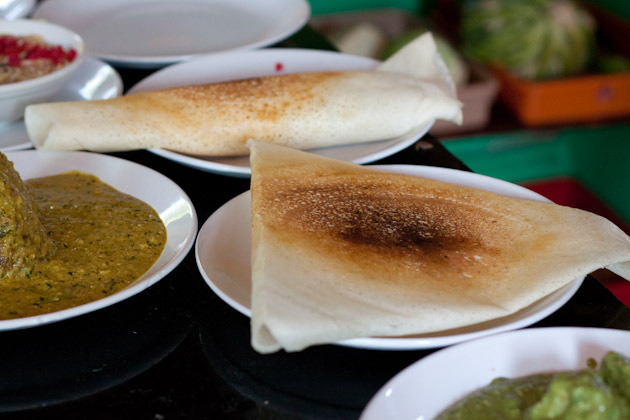 I loved dosa so much that when it came to choosing 6 dishes for the cooking class I attended in Varkala, dosa was at the top of the list! Now, if only I could replicate the recipe at home… more on that later in the week. One of the first things I did when I got home from India was locate a restaurant in Calgary that would support me in living out my new-found love for this amazing fermented meal. When I’m down on my day or missing India a bit too much, I head to Canadian Dosa Corner and I’m brought back to the busy streets of Trivandrum and the food carts of Kallambalam in an instant. 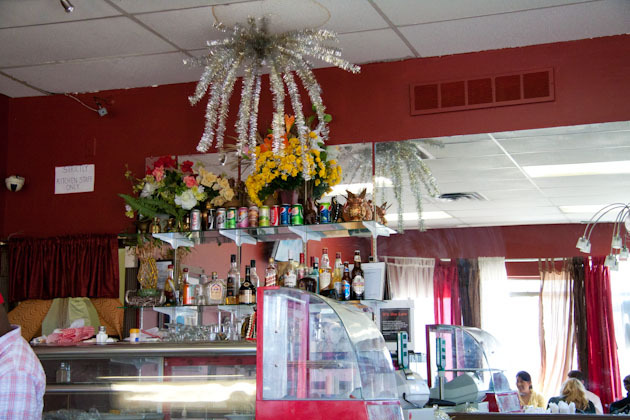 The restaurant is simple and quiet, has free parking out front, and is rarely busy. Every time I go for a visit, I know I’m getting a fresh-made lunch that’s prepared right when I order and will never be over $20, all taxes and tips included. 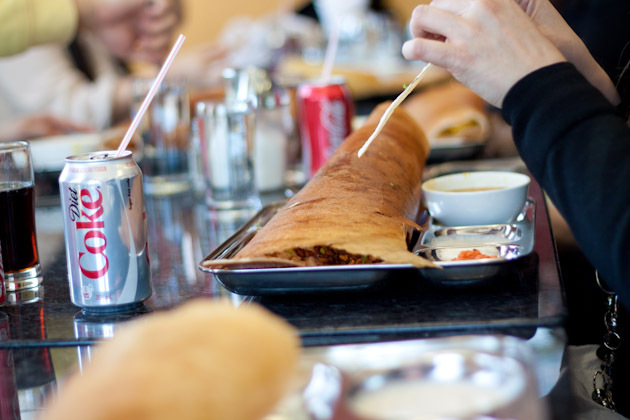 The menu is packed with South Indian favorites – vada, dosa, baji, a girl could go nuts trying to decide what to order. Luckily I never have that problem. 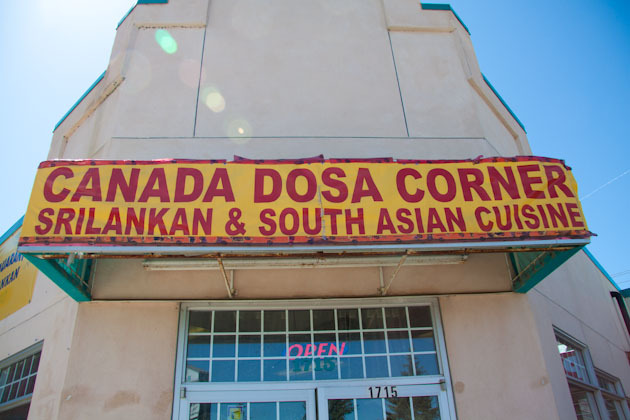 In the past, I’d always been intimidated to go to ethnic restaurants in fear that I wouldn’t understand the menu, but the folks at Canadian Dosa Corner have done a great job at explaining dishes in English for those that aren’t familiar with the items. Also, the staff are very knowledgeable, patient, and are more than happy to guide you through the choices if you’re unsure. I generally go for the masala dosa – crepe filled with spicy potatoes and vegetables, but I wasn’t overly hungry so chose the onion dosa instead. 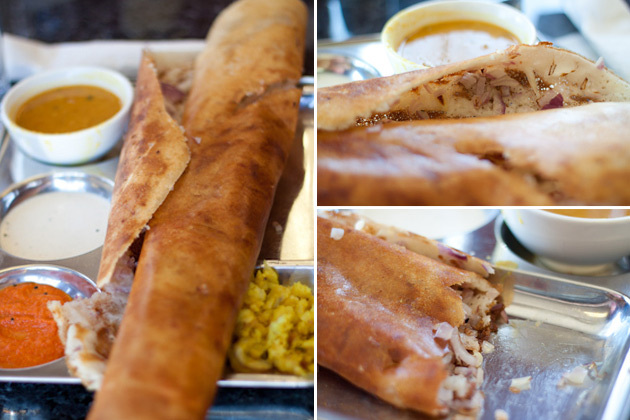 The onion dosa is just that – onion and dosa. 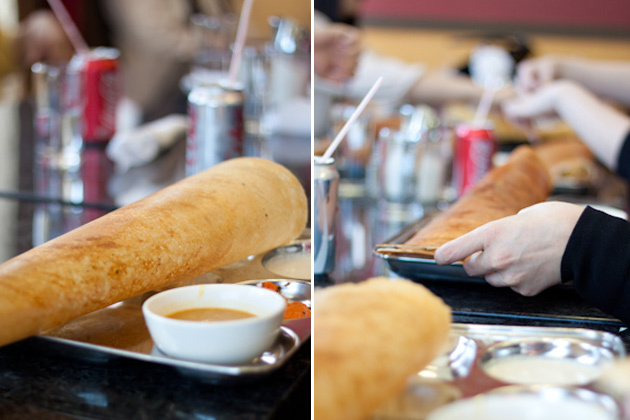 Plain, simple, and; dare I say, better than the masala dosa. The dosa was huge (as usual), had more oil than the masala version, and sported the sweetest red onions I’ve ever had the pleasure of devouring. Each dosa comes plated with sambar, coconut chutney and tomato pulse for dipping. Mine even came with a bit of masala potatoes, too! 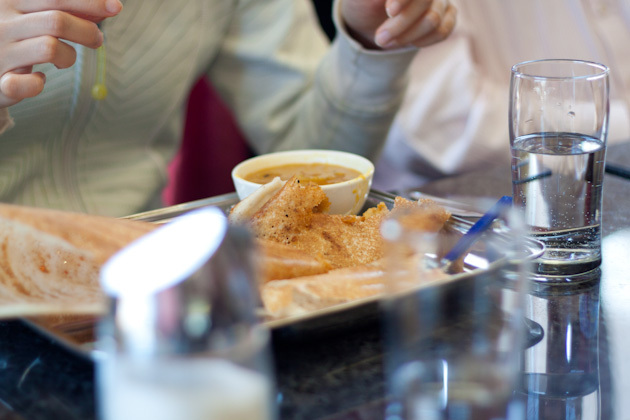 As our plates arrived, many of my colleagues began eating their meals with a fork and knife regardless of being told it was customary to eat dosa with their hands. Not to worry though, halfway through lunch everyone had their sleeves rolled up and their fingers covered in sambar — a great sign that they enjoyed the meal just as much as I did!